Little yoghis make it easy for parents to give kids a healthy, dairy-free option for their lunch-boxes. They come in fully recyclable pouches (through the TerraCycle programme). This product contains real vanilla beans and apple juice, and there is no added refined sugar - the sweetness comes from the fruit itself. Each pouch contains 75ml. 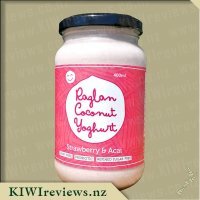 I am grateful that my household don&apos;t have dairy allergies but I am pleased to see that there are alternatives available for those that do and Raglan Yoghurt is a favourite of ours. Miss 7 discovered that I had some Little Yoghi pouches in the fridge and was so excited she begged to have some right then just as dinner was being dished up. I promised her that she could have one for afternoon tea the next day as we needed to have it on the go between school finishing and after school activities. I think she had forgotten about my promise as she squealed with delight to see the vanilla Little Yoghi in the bag of snacks. As a mum I found the squeezey tube so convenient when we are on the run. There was no mess. I didn&apos;t have to remember a spoon and it was portioned out already for us. Miss 7 and Miss 9 both chose to have their yoghurt before any of the other snacks I had packed. 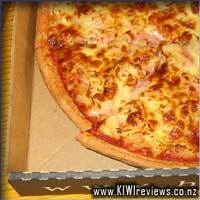 They made sure they had squeezed out every last drop and didn&apos;t leave any for it for me to try. They normally wouldn&apos;t have chosen vanilla yoghurt as to them vanilla is plain and boring but they certainly loved this one. I had a little chuckle to myself when later that night I was baking and Miss 7 told me not to but any coconut in the cookies as she doesn&apos;t like coconut. She didn&apos;t realise that she had been eating coconut yoghurt. 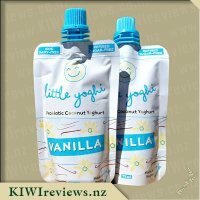 This yoghurt is more expensive than the dairy based ones but it is much more natural and an affordable alternative for those with allergies.We did find that the pouches were a bit small for the girls and they would have preferred a larger size but it would have been ideal for a toddler. I have no kids, but I am lactose intolerant, so I really like to try and find some cost-effective options to get my yoghurt fix without ending up gassy and trapped on a toilet for hours. 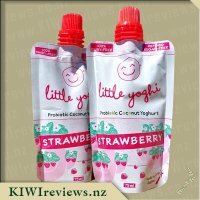 This little yoghi is clearly marketed towards children, with smiley faces on the packaging and simple colourful designs. I like the package. It&apos;s easy to open and close the tops, and the size is perfect for travelling and putting in your lunchboxes. Trying the yoghurt, I removed the lid and gave the packet a squeeze. I found the yoghurt was reasonably thick in consistency, almost like toothpaste. Putting the lid back on, I gave the whole packet a squeeze to ensure everything was mixed together properly, and it did loosen up a little bit and has a better consistency (closer to the consistency of the usual dairy type yoghurts at least). The packaging states that I should keep it refrigerated, but I wanted to know whether it would work well as a lunchbox treat, so I took one to work and ate it at lunchtime. The product still retained it&apos;s cool without being refrigerated during the day, and apart from being slightly softer, there were no effects on the product. Flavour-wise the yoghurt has a good sweetness to it. Not too overpowering, but not boring either. As someone trying to look after my health, I like seeing that it has no added sugars beyond what comes in the apple juice. 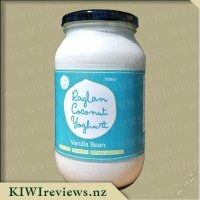 I have mentioned in other reviews of Raglan Coconut Yoghurt products that I loved the use of the glass jars because of the recyclability of the packaging afterwards. The packaging of these foil pouches technically are recyclable, and on the packaging, they provide information on how to contact the recycler that can do the job, but I can&apos;t help but think that it is too easy to just throw them out. People have a tendency to pick the path of least resistance, so I fear the packaging will end up in the landfill. Mr Seven really liked this flavour. I had thought he would go for the strawberry as his sister had done, but he turned up his nose at that. The vanilla flavour, however, really appealed to him. 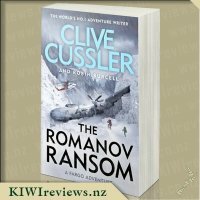 He found it was smooth and very creamy, and the vanilla flavour was just right when mixed with the coconut base. 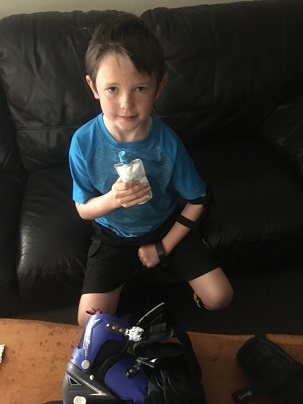 When I gave it to him, he was just getting ready to go roller skating, so he decided to take it with him in the car for when he got hungry and needed an energy boost. He is growing fast and none of us like him to fill up on junk food, no matter how hungry he might be. It was interesting to hear his take on the yoghurt. He is quite perceptive about what he eats, often examining the label to see what is in the food and checking to see that it is all healthy! 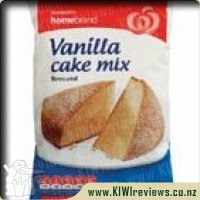 He was interested to see that vanilla was one of the ingredients as he usually finds it rather a non-flavour, but he assured us that this tasted really good and he thought the flavour was excellent! He and his father and sister departed for skating, and his mother and I enjoyed ourselves, having some rare down time. Kids can be full on sometimes! But the time went quickly, and before long he was back, straining to tell us how he had skated really fast and not fallen once. His sister was full of excitement too, but her biggest piece of news was that he had allowed her to have some of his yoghurt and she had decided she liked it too. Both of them were pleased to learn there was more in the fridge for another time. Mr Seven was disappointed that he was not allowed to take his other packet to school, but the children were planning on going to the park after school next day with their father so he accepted the compromise and said he would bring it along to have after he had been on the swing. It was a good plan but it did not quite work out that way. Both children bundled in the door after school announcing that they were dying of starvation, so the remaining two packets of yoghurt were long gone before they had even discarded their school uniforms for play clothes. 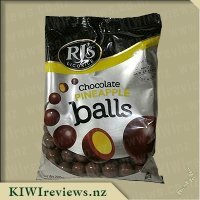 I know what I will be buying them for a treat next time I visit. It is a little expensive, but the ingredients are of the highest quality, and best of all, I know the children are getting a healthy snack. 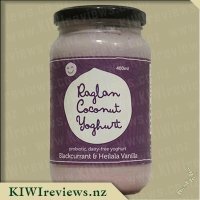 My family loves Raglan Coconut Yoghurt and it is something that we buy quite often with Miss 4 having a dairy intolerance which causes her skin to flare up. 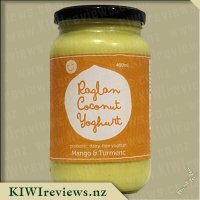 I had seen the Little Yoghi range of yoghurts in the supermarkets over the last few weeks but I must admit I didn&apos;t realise (until now) that they were made by Raglan Coconut Yoghurt, I thought they were just another brand of dairy squeeze style yoghurts targeted at children, so to see that they are not had me very happy as it meant that these could be a great little treat for Miss 4 to enjoy and in such an exciting array of flavours too! I love the packaging of the yoghurts it is simple yet attractive, I loved the combination of the pastel yellows, blues and whites which really makes the packaging stand out, if I had to say anything about the packaging it is that I think the words &apos;Probiotic Coconut Yoghurt&apos; should be bigger and bolder just so people can see from a distance that this is infact coconut yoghurt rather than dairy. 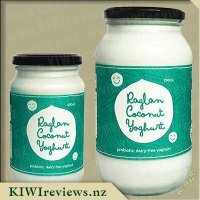 The packaging does a great job at identifying all of the benefits of this yoghurt such as being dairy, gluten, preservative, nut and soy free - great for those with allergies, and that it is vegan and refined sugar-free! I love that the sugars only come from fruit, which in the vanilla yoghurt i&apos;m guessing comes from the apple juice? I loved reading the little fact on the back about vanilla beans its always nice to see a little extra fact on packaging. With 2 of the squeezee yoghurts for review it meant there was one each for Miss4 and myself. Miss 4 ate hers on the way to work/daycare one morning and had no struggles at all in regards to getting the cap unscrewed and eating the contents by squeezing them out which was great, the plastic pouch was easy to squeeze and handle for her little hands, and it was a great mess free breakfast on the run. With the remaining pouch I used it to decorate Miss 4&apos;s pancakes for breakfast with circles to form a butterfly, the pouch worked great in this respect and made perfect shapes when squeezed it was very easy to control and the yoghurt was a lovely consistency which didn&apos;t cause it to run everywhere over the plate, the rest of the pouch I ate myself happily. Taste Wise we both loved this it was creamy and smooth with a luxurious coconut taste to it, and the perfect hint of vanilla that was easy to distinguish throughout the coconut, Miss 4 liked this a lot but said she did prefer the strawberry, however in my opinion this one was better, I loved the versatility of it and can see it going very well with cereal or even in smoothies. 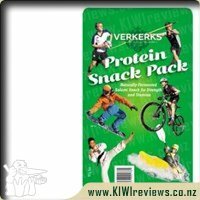 As far as convenience goes these squeezy pouches are fantastic they would make a great addition to any lunchbox for school or daycare or a family picnic or even for those times when your rushing out the door in a hurry and need something to eat. 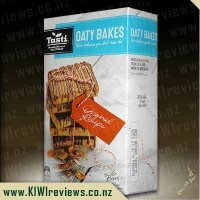 These are something I will certainly be buying again, and I can&apos;t wait to share the news about this product with parents at the daycare I work at whom have children with dairy allergies as I&apos;m sure they would find these handy for there young children to. 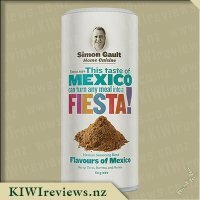 The price is a little on the expensive side but I would happily pay if it means I can keep Miss 4&apos;s skin looking good, they wouldn&apos;t be a every day food but something I would give her several times throughout the week, thanks for another great product I can&apos;t wait to try some other flavours out. 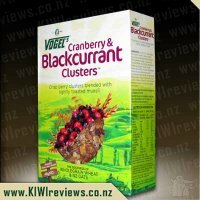 VOGEL&apos;S Cranberry & Blackcurrant Clusters is a delicious blend of crunchy, bubbly clusters and crisp flakes of corn and rice infused with the juicy goodness of blackcurrants. Tangy cranberries, multigrain flakes and oven toasted oats are added for a flavoursome and nutritious breakfast that will fill you full of life and energy, ready to take on the day.